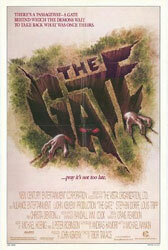 Child denizens of 1980’s suburbia, Glen (Stephen Dorff) and his friend Terry (Louis Tripp) discover a large hole in Glen’s back yard after workmen remove a large tree. Digging down into the hole a bit, they find a geode. After a series of events involving incantations and a dead dog getting dropped down the hole, Glen and Terry find themselves facing down a demonic invasion. Hordes of tiny demons, shape shifters, zombies, plus one not so tiny demon want into our world and Glen and Terry have only the sage advice of a heavy metal album to help them. I have seen ‘The Gate’ more times than I can count and I love it every time. It perfectly captures the eeriness of being a latchkey kid in 80’s, the strange isolation of living in housing developments, and the true nerdiness of being an adolescent heavy metal fan. Although familiarity has dulled the horror for me, the movie still has a lot of scary moments as the supernatural attacks slowly ramp-up. The demons still look good, being a mixture of stop-motion and actors with giant props. The end just skirts with being a bit too hokey for its own good but this is essentially a PG-13 kid’s movie, so it’s forgivable.